Thinking about signing up for OnlineTraffic.com for your online traffic school course? We created this OnlineTraffic.com review to help you determine if this really is the best online traffic school to sign up for. If you haven’t already, check out our official list of the best online traffic schools here. Want The fast answer? 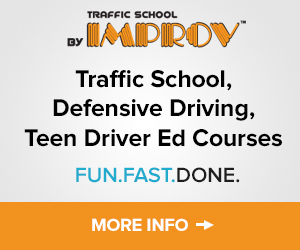 THIS is the online traffic school you should be signing up with! So first of all, let’s answer the most important question… Is OnlineTraffic.com a legit online traffic school? Rest assured, OnlineTraffic.com, also known as OLTS, is indeed a fully legitimate online traffic school. With that said, OnlineTraffic.com is not approved in all 50 states and they are not approved for all traffic violations, so you will need to verify with your local court clerks office if they are approved for your specific violation. With that said, OnlineTraffic.com has been around since 1996 and have had hundreds of thousands, if not millions of drivers go through their traffic school program for ticket dismissal, point reduction, and insurance reduction purposes. They are also accredited by the Better Business Bureau and as of this review, they have an A+ rating. There are only 6 total complaints filed with the Better Business Bureau which is actually very low considering the shear volume of customers they serve. Nothing to be concerned with there. In addition, OnlineTraffic.com appears to maintain a good reputation online both from user reviews and also by other traffic school review sites like this one. Overall, OnlineTraffic.com is not only legit, but they are one of the main players who have been in existence for quite some time now. One of the many areas online traffic schools do poorly on is customer service, so we are pleased to see that OnlineTraffic.com offers 24/7/365 customer support via phone, chat, and/or email. Some online traffic schools only provide customer service during working hours which can end up being a major problem. State requirements mandate various “identity verification systems” to be used. Many of these verification systems are cumbersome to use and may require a call to customer service to verify that you really are you. That’s why it’s important to have customer service provided anytime so that you can get ahold of someone when you need them. We’re glad to see that OnlineTraffic.com provides this level of service to their customers. OnlineTraffic.com is a pretty straight forward online traffic school. First you will need to enter your personal information, enter your ticket info, and answer some questions to verify your identity. Once that is done, you can jump right in and get started immediately. How long you complete the course is up to you – it can be completed in one sitting, or you can save your spot and come back whenever you would like. As for the course itself, well, it’s pretty boring as expected. This online traffic school is mostly set up like an e-book with a lot of text and a few pictures or diagrams here and there. There are a couple videos as you progress through the course, but other than that, this course is not very interactive at all. The course is divided up into 6 sections. After each section, you must complete and pass a quiz. You will not be able to progress forward until you have passed the quiz. And finally, at the end of the course, you will need to take a “final exam” which covers all of the material. Once the final exam is completed, you’re finished! For the majority of you taking this course in the state of California, the completion certificate will be sent to the court electronically. How Long Does The OnlineTraffic.com Course Take? In the state of California, course timers are no longer required for online traffic schools. In the past, traffic schools were forced to put timers on each page so you couldn’t just blast through the course in 20min. These days, you really can blast through it as quickly as you can. As long as you pass all the quizzes and tests, you can finish it very quickly. However, the course is set up so that if you read all the material and take your time, it should take around 6 to 7 hours to complete. We would feel very comfortable signing up for OnlineTraffic.com because they a license and certified online traffic school who has been around for many years with a relatively good reputation online. We are also happy about their 24/7/365 customer support and A+ rating with the Better Business Bureau. Overall, this appears to be a solid online traffic school and a company who goes the extra effort to take care of their students. We still haven’t found that perfect online traffic school and OnlineTraffic.com is certainly no exception. For starters, the course is very boring. There isn’t much offered in the way of interactiveness and if you prefer video over pages and pages of text, you’re out of luck. They do not offer a video based version of their online traffic school course. Perhaps our most critical opinion of OnlineTraffic.com is their spammy advertising methods. OnlineTraffic.com is not only a known internet spammer, but we have personally been the victim of their “comment spam.” Basically, they go to websites related to driving, and link back to their site as much as possible using either automated systems individuals sent out to create this spam. We of course take this very personally and are sad to see companies still using these unethical advertising practices, which leads us to believe there are other things going on in which may tread the ethical lines. Overall, this is a perfectly legitimate online traffic school with a long business history that provides above average customer service. However, we do not like the “boredom factor” of this course and also take offense to some of their spammy advertising practices. For this reason, we have given OnlineTraffic.com a 3 star rating making this an AVERAGE online traffic school course. Do you have experience with OnlineTraffic.com? We want to hear from you!! Please post your experiences (good or bad) in the comment section below. We hope you found this OnlineTraffic.com review helpful and be sure to check out all of our other online traffic school reviews here. Certified in the entire state of California (Lic. #1978). Course is a bit outdated.